How are your New Year’s resolutions coming along? Still going strong? If you’re like most people, the answer is a sheepish “No”. How does that make you feel? Disappointed? Frustrated? Embarrassed? All too often, I think we try to “reach for the stars” and “aim high” when in reality our goals should be more along the lines of “reach for the ceiling” and “aim slightly above the horizon”. This causes us to fail. And if we fail too often, we run the risk of becoming demotivated. Last summer I had the opportunity to participate in a training program led by BJ Fogg. BJ founded the Persuasive Technology Lab at Stanford where he conducts research into how technology can help us to modify our behavior. 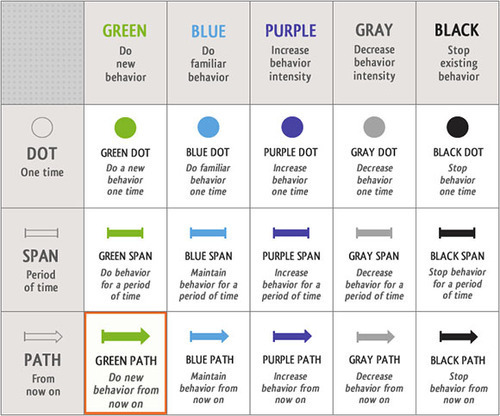 He has developed a Behavior Model that shows how each type of behavioral change should be addressed. What I learned was that we need to use different behavior modification techniques based on the type of change we’re trying to make. Are you trying to stop a behavior? Start a new behavior? Resume a familiar behavior? Increase an existing behavior? Do you have a short-term goal you’re trying to achieve or is your intention to make a more permanent change? You’ll need to take a slightly different approach for each situation. Here’s an example. Saying something like, “I’m going to exercise three times a week” is likely to be a failure from the start. Have you ever exercised three times per week before and you just need to get back on track, or is this a new behavior for you? Do you intend to do this for the rest of your life, or just for the next 90 days? Unless you know this, you probably won’t put the right strategy in place in order to be successful. I can’t go into all the details of BJ’s research here, but I’ll share one simple technique that you can implement today to begin the process of reaching your goals, so grab a piece of paper and a pencil. First, think of three goals that you’ve had on your mind (e.g., “I want to start exercising”, or “I want to learn to play the guitar”). Now, you need to convert this goal into a tiny, realistic habit that you can implement today with minimum effort. BJ calls these “tiny habits”. In order for something to qualify as a “tiny habit” you need to be able to do it in less than 30 seconds with zero pain, so saying “I’m going to do 50 pushups” doesn’t qualify as a “tiny habit”. As soon as I finish brushing my teeth, I will floss one tooth. As soon as I finish eating dinner, I will play one chord on my guitar. As soon as I get out of the shower, I will do one pushup. Finally, celebrate. As soon as you complete your tiny habit, put your hands in the air and cheer for reaching your goal. When you finish playing that one guitar chord after dinner, say, “I’m awesome!” When you’re sitting in a meeting at work and you recall that you flossed one tooth that morning, smile to yourself and think about how you’re that much closer to reaching your big goal. It sounds silly, but this final step is important. Your body needs to physically feel the satisfaction that comes with having this tiny habit in place. It improves your motivation and helps to solidify the habit. What do you think of the concept? Have you tried something similar? I’d love to hear about your experiences putting some tiny habits in place.